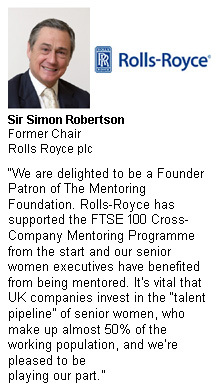 The Mentoring Foundation owns and operates the leading, internationally recognised, FTSE 100® Cross-Company Mentoring Executive and Next Generation Women Leaders Programmes. Our work is at the heart of activity in the UK to help more women reach the very top of large organisations and has a strong history of success. Many of our Mentees go on to be appointed to the Executive Committee of their companies, to be Non-Executive Directors on the Boards of other companies, or otherwise to progress their careers. achieve even greater success, at top executive level and in the Boardroom. See what our Mentees say. The FTSE Executive Programme is unique in its longevity, with a 16-year track record and proven success, with more than 70 Chairs, Chief Executives and other senior leaders acting pro bono as Mentors. 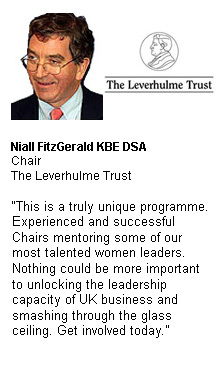 The FTSE Next Generation Women Leaders Programme, launched in 2014, helps companies to build their talent pipeline. The programme’s first seven cohorts were supported by 28 leading FTSE companies. Cohort 7 launched at the beginning of 2018, Cohort 8 launched in October 2018, and Cohort 9 will launch in January 2019. In addition to these ground-breaking Programmes, the HSBC Mentee Network enables our Mentees to learn from each other as well as from their Mentors. The Chief Executive of the Foundation, Peninah Thomson OBE, is the author of original research into women’s leadership, including publication of five high-reputation books. The not-for-profit status of the Foundation ensures that all revenues are reinvested in our work. "More women on the Boards of our large companies in the UK isn’t going to solve global problems at a stroke, but it will contribute to their solution, by increasing the reservoirs of human ingenuity, imagination, insight and will available to address them."